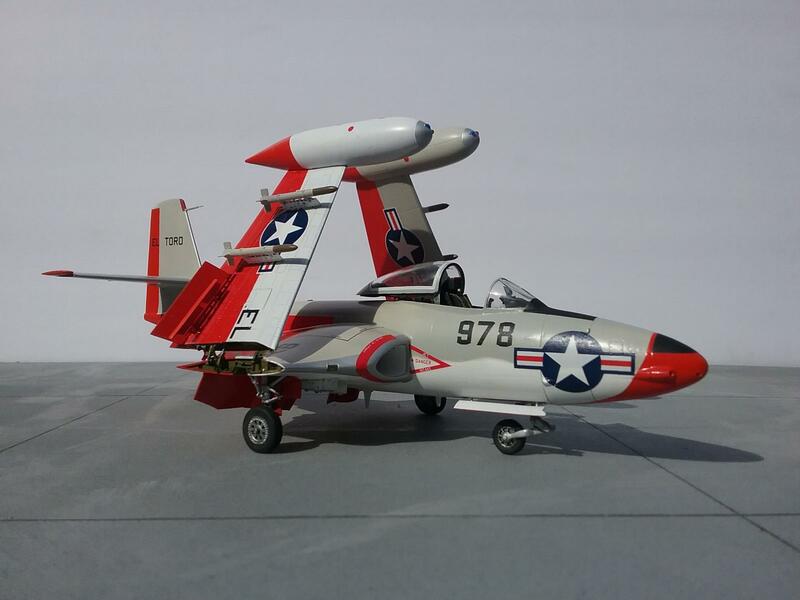 This is the Kitty Hawk F2H-2 done almost OOB, using kit decals. 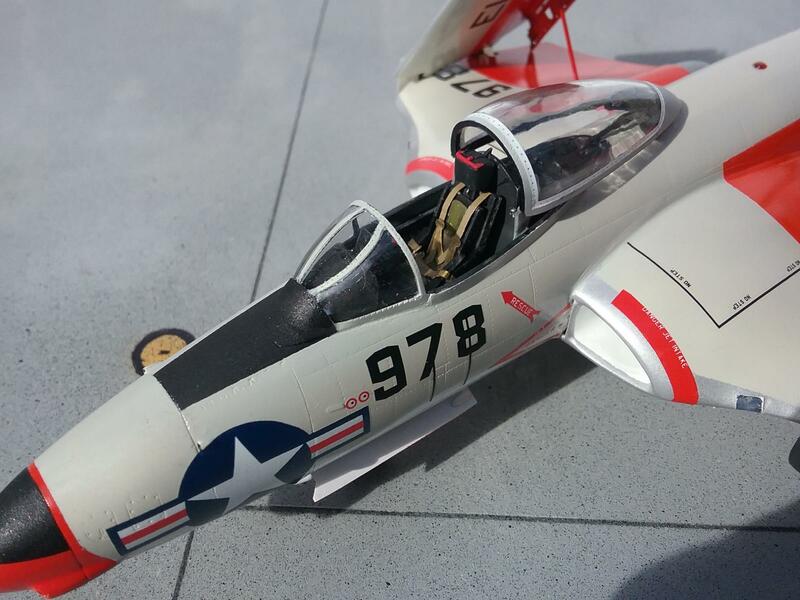 I added Furball canopy decals, along with a scratched metal pitot. 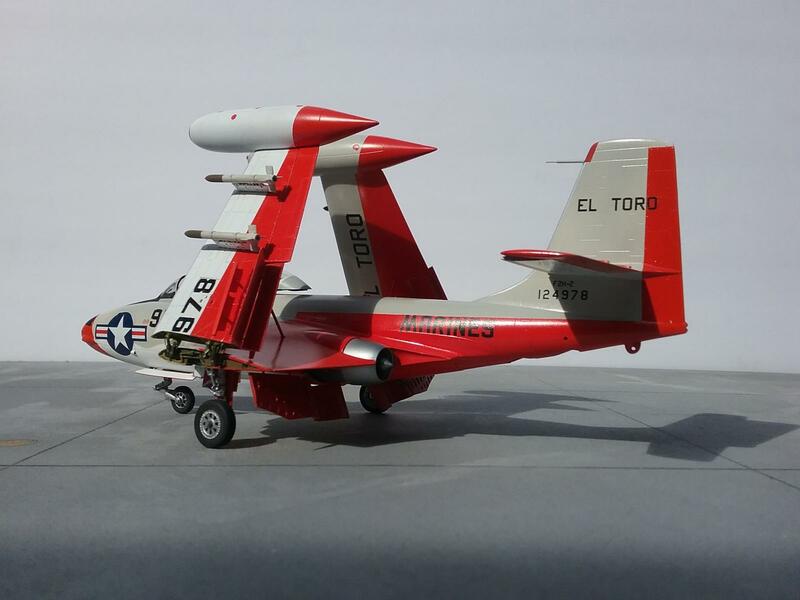 Reading the reviews of this KH kit is not very much fun, because they highlight a lot of problems that this kit has; the biggest of these is arguably the too-rounded shape of the upper wing, as it joins the fuselage. Another issue is with the shape of the intakes, which are also a bit too rounded when compared with pix of the real thing. The canopy also requires attention because the real article rides on struts that raise it up when open, but KH didn’t address this issue, and just has the open canopy resting on the fuselage. There are other issues with the kit, but it would take awhile to go through each, so I’ll leave it there. In the event, I managed to tackle each of the listed problem areas, and pushed on through to the finish line…Yeah! This is not a shake & bake Tamiya kit…it requires some scratchbuilding skills. Perhaps the thing that helped me the most with building this kit is brass rod; I drilled and pinned a lot of the small parts, especially the flaps and landing gear doors, which did not have secure attachment point. Pinning helped, especially when assembling all the pieces. The speed brakes that extend above and below the wing are PE and plastic; these parts are a PITA, for sure. 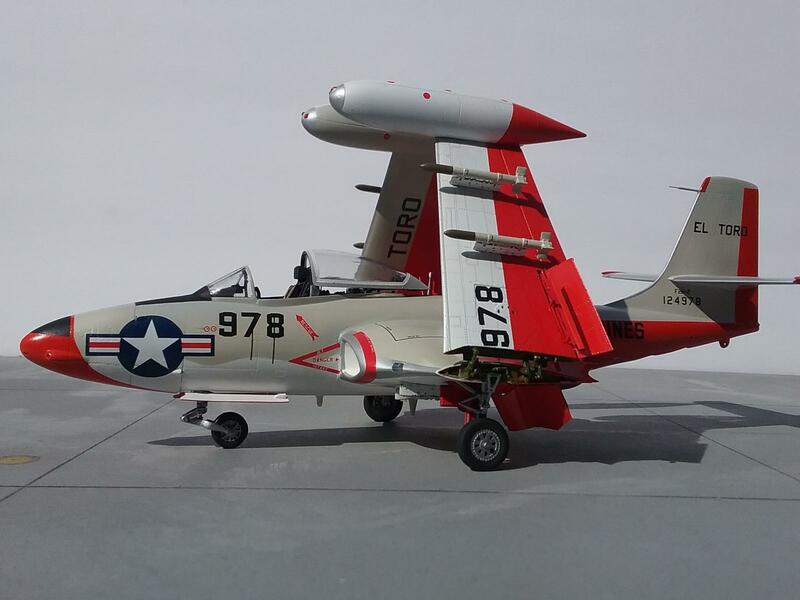 This kit can be built with a fighter nose or a recon nose. I chose the fighter nose, but the recon nose parts are nice and it’s a shame not to use them. Likewise with the decals; the photo version has nice markings and it’s a shame not to use them. Overall, this Kitty Hawk kit is typical Kitty Hawk, with lots of fiddly parts and iffy construction. Despite what I’d heard and read (plus your additional “points of interest”), this build turned out spectacularly IMO. You’ve done an outstanding job bringing this kit up to today’s ‘standards’. Nice work, sir! Thanks so much for your kind words…I apppreciate it. Well done for sticking with it and hanging in until you could deliver a knock outblow. Lovely, lovely result. Thank you, David. You are very kind. Marvin, Looks like you won this battle, this is beautiful. Seems you have knack of taking on tough kits and turning out a nice finished product. 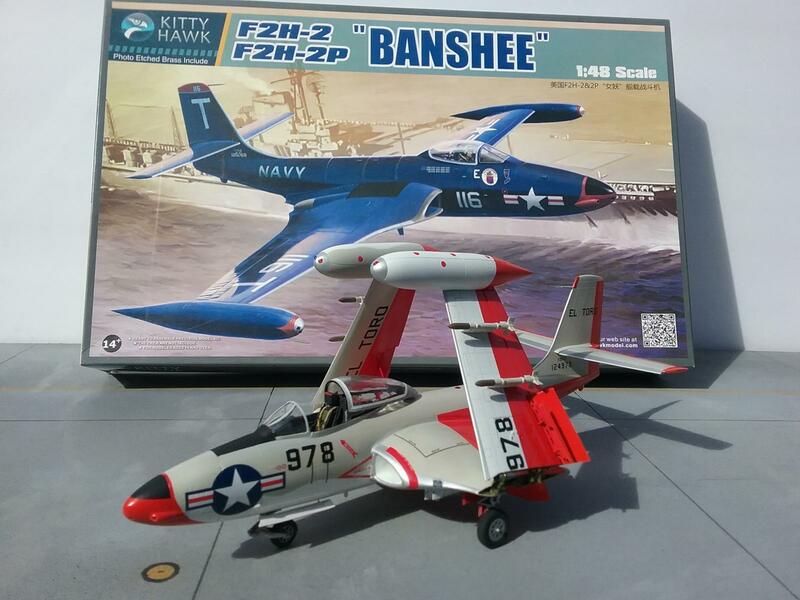 (I will not get on my soap box and yell at Tamyia “Hey give us a Banshee”, or a list a bunch of other kits we modelers would like to have). No, I’ll just sit back and enjoy the nice work we have here. Well done ! Terry: Thanks for the compliments. This kit was a beast, but an old man’s perservearance will always prevail over an obstinant kit (or else the kit gets binned!). This kit really tested my patience, due to its many issues. The kit looks finished, but I’m still thinking about ways to improve it (I think I may have a disease, or something). Thank you, Jirka…I appreciate it. Very good work! Scratchbuilding is an art of its own. Keep it up! Thanks, Matthew Sometimes I think Kitty Hawk means scratchbuilding. Love this jet! Really nice looking build. Love the theme…it really pops. I wish this kit did not have so many issues b/c I really want to build it but not sure if I can cope with the issues as well as you did. Lost my patience for this type of manufacturing with modern high-end kits. Kittyhawk has the BEST subject matter I wish they could just get it together one day! Looks like a Banshee to me, Love the color scheme! Thank you, Robert. The scheme is included with the kit, which gives four options to choose from. I liked the Gull Grey/White rather than the Sea Blue scheme. This colorful scheme was certainly a lot more work than the blue scheme, but I like the more colorful look of it. Kudos to you for surviving and thriving with this. For me, it’s further evidence that Life Is Too Short, no matter how much I like the subject. Thank you, Tom. Your kind words are always appreciated. Nice work, Marvin. That kit was a big disappointment to me. I am hoping to build mine this year, though. I’m going to build the recce version, figuring the longer nose will draw attention away from the fat wings. The Banshee kit takes a bit of effort, mainly correcting things that just have to be fixed. With that, you better get started on yours because this one doesn,t build itself. 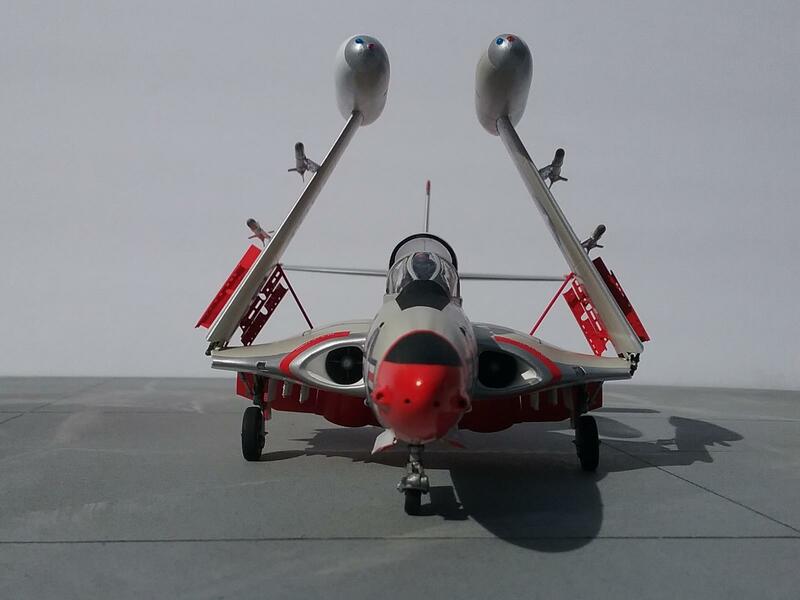 I like your choice of the photo nose; the longer fuselage makes the model look more elegant. Lovely result! Looks to me like all the work paid off. That’s a beautiful model. Thanks, Greg. Your always have nice things to say…I appreciate it.